I had waited for this movie for quite awhile and was thrilled and excited to Watch it, especially after having seen the trailer. The story in "Zombeavers" is fairly generic as horror movies go: a group of young people go to a remote lake for some partying and things go awry. And what was supposed to be fun and games becomes a matter of life and death. But thrown in a bunch of zombie beavers and things are turned up a notch. These zombie beavers were somewhat fake, visually, but also hilarious, which just added to the enjoyment of the movie. Sure, the movie was predictable in every aspect, but the combination of horror and comedy worked well and I was quite entertained by this movie. The acting in the movie was good, although I can't really claim to be overly familiar with the cast as such, aside from Rex Linn. 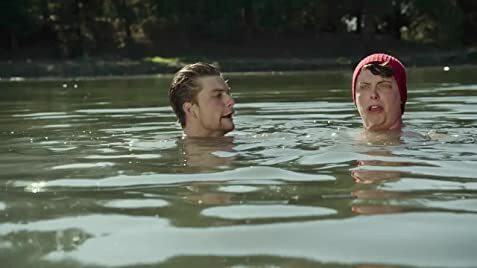 That being said, I will go on to saying that the people did perform well enough in "Zombeavers", which was a nice thing, as it did elevate the movie experience. And the aspect of having zombie beavers did bring about a fresh of breath air to the zombie genre. I am sure that many will not find it enjoyable, but I did, and it entertained me quite well. I think it is good when the movie-makers manage to pull off new takes on the zombie genre, especially when it works as well as it did in "Zombeavers". If you enjoy zombie comedies such as "Dead Alive" or "Shaun of the Dead" then you will also like "Zombeavers". Near the end of the closing credits there is a disclaimer that "No animals were harmed during the making of this film, although the bear did receive a purple nurple (not our fault, he started it.)" The barrel of toxic waste at the start of the movie was obviously an empty barrel - full barrels wouldn't float that high in the water (if at all). Outtakes are shown before the credits roll.